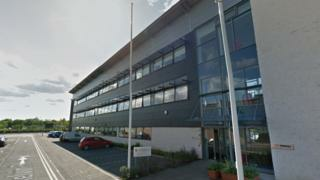 East Dunbartonshire Council has been told it must "significantly up its game" by a local authority watchdog. The Accounts Commission has highlighted concerns over the council's ability to make necessary savings. An audit found that problems identified at the council in two previous reports had not been addressed. Council leader Rhondda Geekie said improvements had been made but added there were areas where further progress was needed. East Dunbartonshire has agreed a "transformation programme" aimed at making savings and changing the way it delivers services. The Accounts Commission found that much of this programme remains behind schedule - a threat to the council's ability to achieve £27.6m in savings over the next three years. The report said improvements have been made in financial management but there are concerns about the range of skills and experience in the financial team. East Dunbartonshire is now looking at sharing services with neighbouring councils but it is not yet clear what savings will result, it said. Accounts Commission chairman Douglas Sinclair said: "All councils face future funding gaps and are having to make radical changes in how services are provided. "East Dunbartonshire needs to significantly up its game to deliver on its ambitions." Ms Geekie said the council had worked to respond to all the concerns outlined in the Accounts Commission's previous report in June 2015. She said savings of £40m had been made in the eight years to 2015/16. "Local government has faced unprecedented and relentless budget cuts in recent years, and no-one can deny the challenging financial environment we all face," she said. "Our transformation programme was agreed by this council to ensure that we identified and delivered every possible saving. "We acknowledge that there are areas for further improvement across our organisation and whilst I look forward to our meeting with the Accounts Commission to discuss the best value audit findings, I think it is important that we consider the wider findings and not focus only on the more negative highlights."